A winning paint job on a 1955 Chevy Bel Air has seen a small town car painter’s work featured in a major Hollywood movie. Todd Holland, who owns Re Automotive in Stratford, has recently finished doing graphics work on motorbikes used in Ghost in the Shell featuring Scarlett Johansson. The movie opportunity came about after the business completed work on a 1955 Chevy Bel Air owned by New Plymouth businessman and Americarna organiser John Rae. After painting finished on Rae’s car he then sent it to Gabe’s Custom Interior in the US, who feature on TV show American Hot Rod. Gabe’s entered the car into the Grand National Roadster show in Pomona, California where it won best in class in the Semi Hardtop category of the show. After the car’s win in America, Wellington company Human Dynamo contacted Holland about doing work on the motorbikes for the Ghost in the Shell movie. Business has been booming for Holland and the workshop is now one of NZ’s premier car custom fabrication shops. The business, which Holland started with his brother Scott nine years ago, has three staff but “if it keeps growing like this then we may need more,” Holland said. One of its specialties, and the procedure they used for the bikes in the movie, is fluid coating. Fluid coating is a process where images are transferred on to three-dimensional surfaces using water, a process which can take around two days. While busy getting work from people all around the country, Taranaki support for the business had been really strong too. 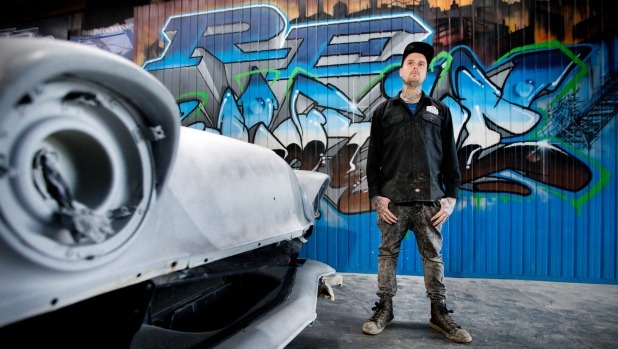 “Taranaki has quite a few petrolheads and a really good car culture here,” Holland said.